Ace Attorney DVD Review Kotaku says Ace Attorney is the “best video game movie ever” and they’re not wrong. In my younger years I couldn’t get enough of the Phoenix Wright video games. I played through and beat them all in a week, and once I was done I started again. Upon the announcement of a movie based on the first (and the best) game in the series, Phoenix Wright: Ace Attorney, I was torn. Sure I was excited at the prospect of a film based on one of my favourite games, but that being said it would be a video game adaptation and we all know how they usually end up. Thankfully for the most part Ace Attorney gets it right. Directed by Takashi Miike and starring the who’s who of Japanese film, this is a film that honours its source material in nearly every single way. The humour, the great characters and the mystery from the original game has all been transferred to the big screen making for some of the most entertaining viewing this year. For those not familiar with the franchise, Phoenix Wright is an amateur defense attorney who’s low on confidence but can still come home with the goods. After beating one of his childhood rivals, Miles Edgeworth in a murder case, Wright’s newly found fame as a star attorney is quickly put to the test as Edgeworth is charged with murder, and becoming his lawyer. Courtroom dramas have never been the most entertaining spectacles in movies but Ace Attorney sure makes a name for itself in that department. This is a classic example of Japanese comedy, with over the top movements, voices and visual flare throughout the film. Wright’s friend Larry Butz is as funny and wacky as he was in the game. Just like the game it’s based off Ace Attorney becomes a little longwinded towards the end. This is a long film, clocking in at over two hours with the final third being an extremely dark conclusion to an otherwise colourful piece of film. 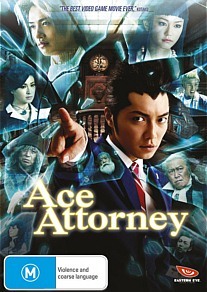 Kotaku says Ace Attorney is the “best video game movie ever” and they’re not wrong. It’s not an entirely perfect film with some pacing issues and sudden shifts in tone, but it is still a genuinely funny and entertaining piece that deserves praise for keeping true to its source material. As a fan I am very pleased with what Miike has managed to create and here’s hoping for a sequel in the near future.